We’ve put together a small selection of gifts that cater for all budgets and tastes whether you’re buying a gift for a complete beginner or a seasoned Yogi. These are just a few suggestions that we’ve curated to inspire you but if you’d like further inspiration or advice, please call or email and we’ll be happy to help. The Born Peaceful Hygge Blanket draws on the lovely Danish concept of the same name. There’s no direct translation but Hygge encompasses the feelings evoked when experiencing the comfort, cosiness and of contentment associated with time spent with family and friends in a cosy environment maybe with candlelight or firelight. With embroidered doves and a large label featuring words and feelings associated with Hygge, this blanket makes a perfect gift for someone needing some extra love and care. 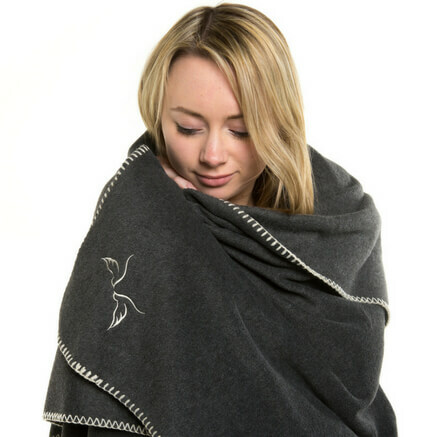 Whether curling up on the sofa or resting in Savasana, this blanket is warm, thick and cosy. Sally has been influenced and inspired by her travels to the East and her many years of Yoga and Meditation. 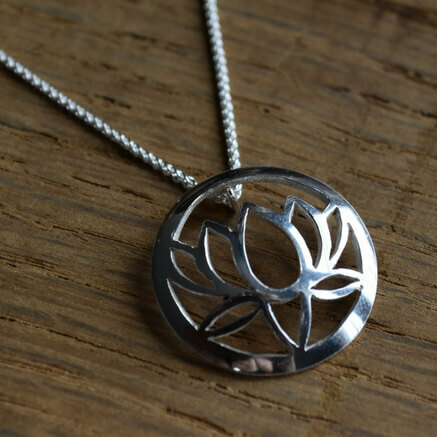 She uses the traditional symbols and imagery experienced on her travels, the Hindu deity Ganesh, the Lotus flower and the sacred Om symbol and gives them contemporary treatments using Silver, Gold, and ethically sourced semi-precious stones. Each piece is designed and handmade by Sally here in the UK and any piece makes a really special gift. These mugs made a wonderful gift for anyone who loves Yoga. Great for enjoying a peaceful moment with a calm cup of herbal tea or a warming cup of coffee. 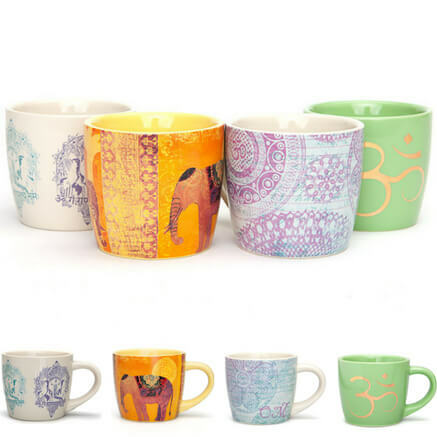 With four vibrant Yoga inspired designs to choose from, each one reveals an Om at the bottom of the mug. These mugs hold about 300ml, so perfect for a quick cuppa and are dishwasher safe. Buy all 4 designs and save 10%. 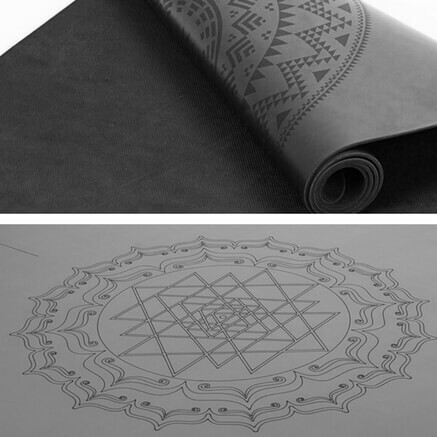 The Phoenix Mandala and Yantra mats are perfect for an intensive Yoga practice like Ashtanga Vinyasa Yoga and also any Yoga practice where grip is particularly important. Black and grey colouring and subtle designs and prints make these mats especially popular gifts for men. These mats are made from natural rubber with a polyurethane coating and are free from AZO dyes, DOP softeners and heavy metals, and also are 6P free, so no nasties to come into contact with the environment or your skin. 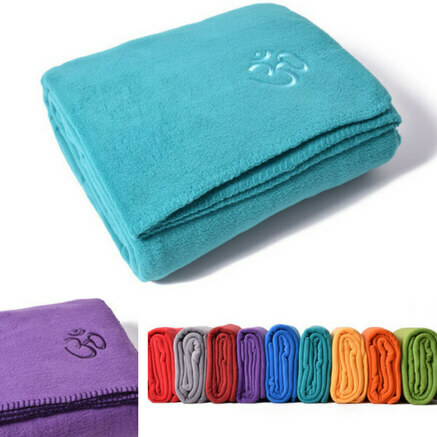 A Yoga Blanket makes a great gift. There’s no risk of the blanket not being a good fit and they are always useful. We have a range of vibrant colours, something to suit every taste and style and to bring some colour into a person’s life and yoga practice. We also have some natural cotton blankets for those who’d rather wrap up warm in a more natural fabric. Let the power of colour enhance someone’s Yoga or Meditation practice. 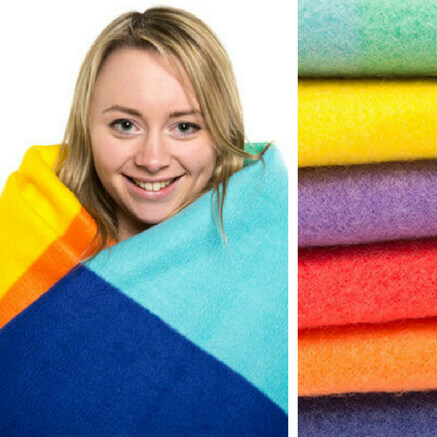 The Chranket is a cosy fleece blanket inspired by the colours of the Chakras. It folds neatly into its own zipped fleece bag and can be used as a support or cushion during Yoga or Meditation. A great gift to help your nearest and dearest stay centred whatever life throws at them, enabling them to do their best at work and at play. Scentered nourishing balms have been carefully formulated with a blend of moringa and shea butters to ensure a non-greasy finish on the skin and long lasting fragrance delivery. 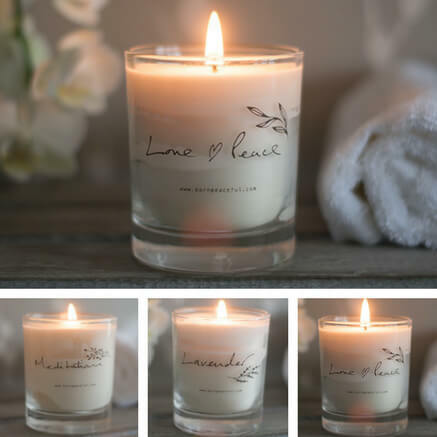 Relax and unwind with our beautiful range of candles, handmade in England. 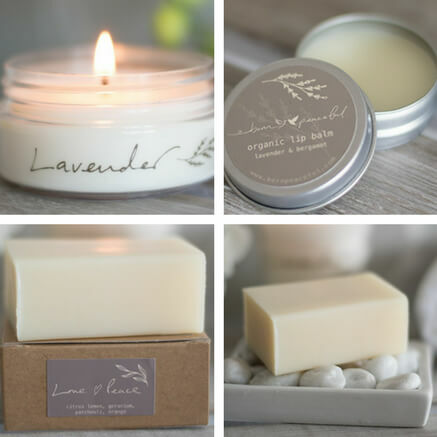 Subtly scented with essential oils and made using natural plant sources, hand poured into recycled glass, and packed in a lovely recycled board box. 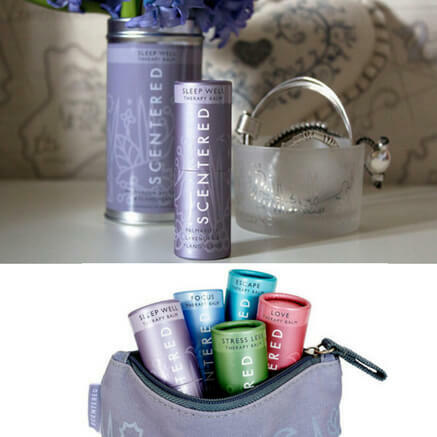 These are ‘clean burn’ candles and contain NO petroleum based wax, dyes or fragrance. They’re great for the home, yoga studio, for meditation or just for relaxing and make a wonderful gift. 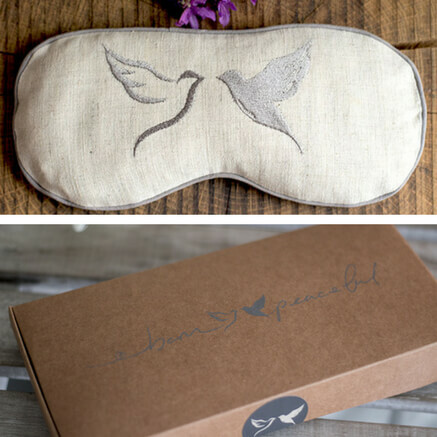 A Natural Linen Eye Pillow with Lavender and Flaxseed filling. The linen fabric is soft and cooling. The pillow gently moulds to the contours of your face with a light pressure, blocking out light, relieving tension and calming the muscles around the eyes. The subtle lavender scent is uplifting for the mood and relaxing and calming to the senses. Perfect for deepening relaxation during Savasana. Comes wrapped in tissue paper within a recycled board box. Makes a perfect gift. We have a range of small gifts which make perfect ‘stocking fillers’ or small gifts. Organic Lip Balm, Organic Soaps, Travel Candles, Incense, Incense holders, Tea light holders and various different styles of Oil Burners, all make great gifts. TWe have a wide range of Yoga Clothing for women from the classic and elegant Asquith range, the sumptuous range of Manuka Life Yoga leggings with beautiful Lotus Flower and Om designs to Yoga Inspired Born Peaceful Yoga and Loungewear. Do call or email us for advice with sizing. 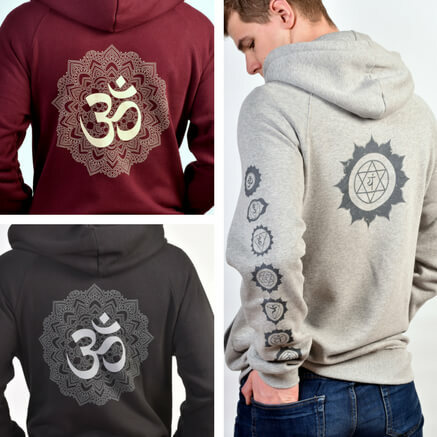 We have a great collection of Yoga trousers, shorts, t-shirts and hoodies for men, with comfortable, breathable fabrics, bamboo and organic cotton. Many feature Yoga Inspired designs and prints. Please call or email us for advice with sizing if you need it. If you’re buying a gift for someone who is thinking of taking up Yoga or is a beginner, a Yoga Kit might be the right gift. We have a range of Yoga Kits to suit most tastes and budgets. 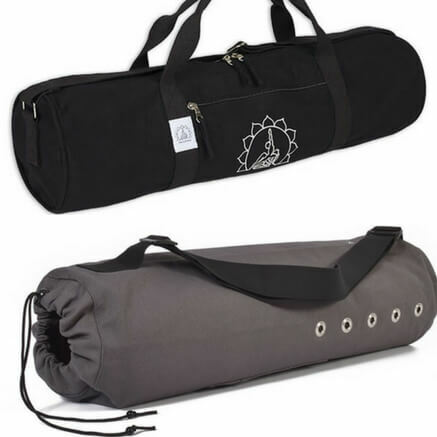 A new Yoga bag is always a fantastic gift and we have a wide range to choose from. From subtle, understated styles in blacks, greys and muted colours, to more vibrant, colourful designs, something for every taste. 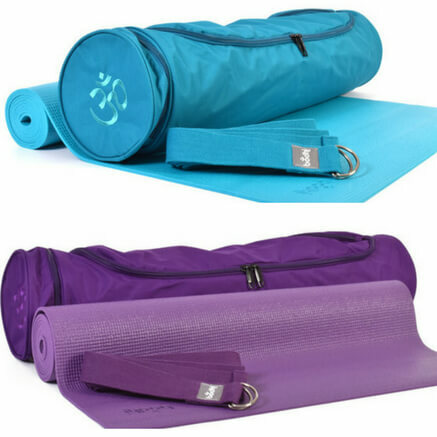 When buying a Yoga bag it’s a good idea to know the size of the Yoga mat that is to be carried and also if the bag needs to accommodate any other items, such as a change of clothes, blanket, or blocks. Sizes range from bags designed to carry a single mat to larger, roomier holdall style bags. Please call or email for advice on the size bag you might need. If you know that your loved one loves Yoga but you don’t know what they’ve already got and what they need, a Gift Certificate makes a practical and thoughtful gift. Our gift certificates are valid for one year and can be purchased to any value. 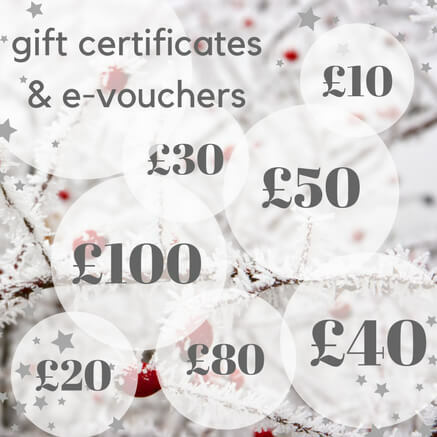 If you’re buying for someone in another country or perhaps you’ve left your gift buying until the last minute, you can purchase an E-Voucher which is sent to the recipient by e-mail, so they can receive it immediately.